So since Vegas never materialized (see previous post), we went out to a nice dinner instead in neighboring Pleasanton. Main street in downtown Pleasanton is a short boulevard home to several restaurants, bars, shops and businesses such as salons and the like. It’s especially nice to stroll around during Christmas when holiday lights adorn historic buildings from the 1800s. On the surface, downtown Pleasanton looks unassuming but dig deeper and you’ll find that Main street has had quite a history. Check out this walking tour guide, complete with stories of brothels, murders and ghosts. 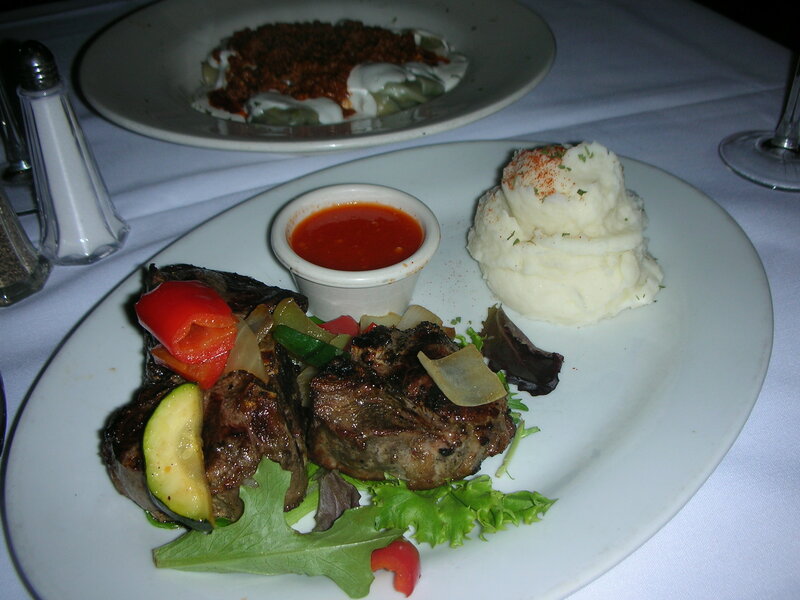 We had dinner at Oasis Grille & Lounge, a nice restaurant serving Americanized Afghanistan food. We split a shrimp appetizer and I had braised lamb shanks with mashed potatoes while Hubby had Aushak, which is leek and cilantro tortellini in a yogurt and meat sauce. 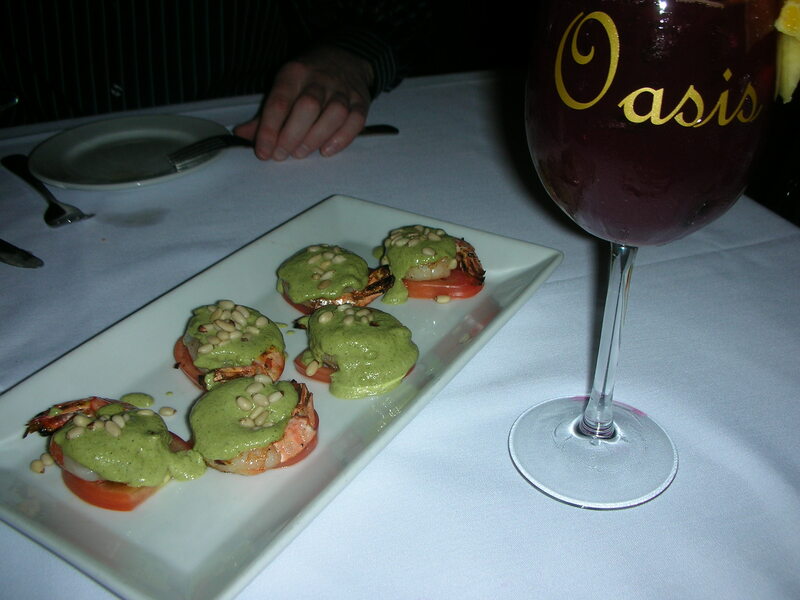 I thought everything was quite yummy, especially the basil sauce & pine nuts on the shrimp. The lamb was very tender and didn’t taste too gamey. I didn’t think Hubby would like leek and cilantro tortellini but he gobbled everything up. My parents are from Vietnam so I know cilantro quite well but I had no idea that cilantro is eaten in the Middle East as well. The only thing that irritated me was that we felt rushed through the service, not from them wanting to turn over the table I believe (as there was no one waiting) but simply because they’re used to immediately clearing the table and serving your entree when they see you’re done with the app. In Holland, it’s quite normal to be in a restaurant for hours as they expect that you want to take your time and enjoy your company. Placing a check on the table when the diner just finished eating just doesn’t happen. Here, you can be seated and out the door within an hour. Hubby asked if next time, we should order the appetizer and then wait until we’re done with that and ready to move on to order the entrees, instead of ordering everything all at once. Yup, that’s how you do it! Throughout dinner I couldn’t help but feel irritated at this lady the next table over who kept going on and on about her daughter’s school. So this is what the rest of the world means when Americans are loud huh? We capped off the night by meeting up with friends for frozen yogurt. Saturday, we went to Hubby’s company’s holiday party at La Mar Cebicheria Peruana, one of my favorite places in San Francisco for a hip dinner. They rented out the covered and heated back patio. After a few hours of wonderful Peruvian dishes, drinks and conversation, we went off to dance at Slide, a speakeasy from the Prohibition era. Back then, it was known as restaurant Cafe Dans. Those in know, however, pushed a secret wall to slide down for drinks. I didn’t indulge in any more drinks though. One vodka cranberry, two pisco sours, a passion andina, and a pisco punch at La Mar was more than enough for me. Best thing about my apartment? That it’s across the street was a subway stop. The weekend was capped off with a birthday/holiday party at a friend’s apartment. Note: the image of a bunch of people dancing along to songs and choreography from Wii’s Just Dance 2 is more than I can handle. 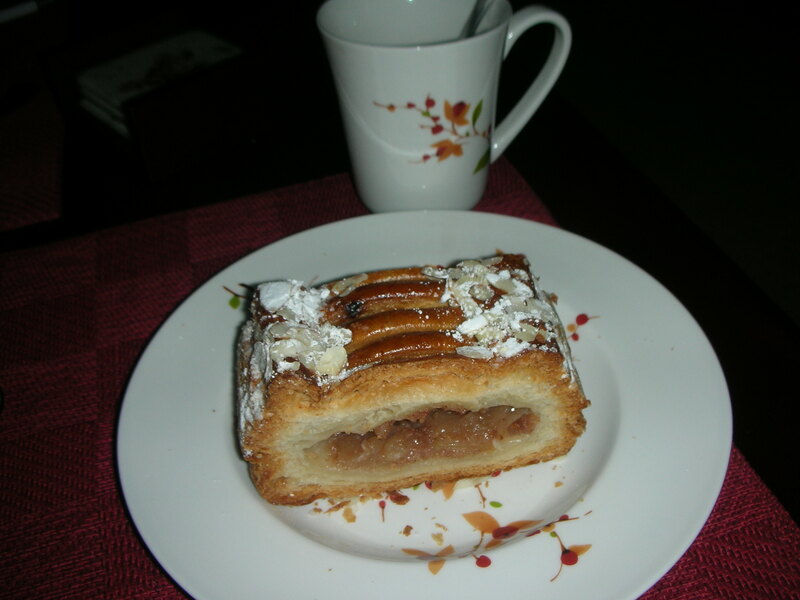 And finally, what better way to end the weekend than with an apple strudel from an European bakery a few blocks from the apartment?